Chicago, IL - The glorious and salvific Resurrection of our Lord, God, and Savior Jesus Christ was joyously celebrated today at Holy Resurrection Serbian Orthodox Cathedral in Chicago, Illinois, with a Hierarchical Divine Liturgy celebrated by His Eminence Metropolitan CHRISTOPHER of Libertyville-Chicago, with the concelebration of the Cathedral Clergy, while responses to the festive Liturgy were sung by the Branko Radichevich Choir.Prior to the Paschal Liturgy, the Matins of the Resurrection and Procession symbolizing the early morning walk of the myrrh-bearing women to Christ's empty tomb, was celebrated starting at 11:30 PM on Saturday. Welcoming the beloved Archpastor to our Holy Cathedral on occasion of this joyous feast of feasts, Cathedral Dean Fr. Darko Spasojevic thanked His Eminence for his prayers, blessing and care, and wished the faithful that the radiance of Christ's Resurrection may shine in their heart, souls, homes and families. Blessing the congregated faithful and wishing them a joyous feast, His Eminence Metropolitan CHRISTOPHER stated, " in light of this Christ's Resurrection we need to struggle and live faithfully to our Christian commitment." The Paschal Encyclical of His Holiness Patriarch IRINEJ on behalf of all the bishops of the Serbian Orthodox Church was also read at the Liturgy, after which a holiday banquet was served for parishioners at the Main Hall. 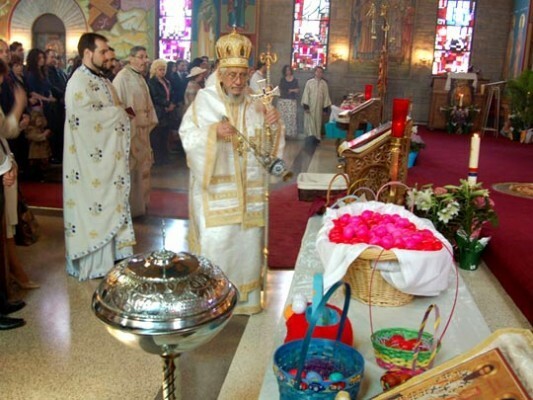 The Celebration of the Cathedral's Slava will take place next week on Sunday, April 11, 2010, with one Divine Liturgy at 9:30 AM, and the Cutting of the Slava Kolach and Festal banquet immediately thereafter. GLORY TO YOUR CROSS AND RESURRECTION, O LORD!